The Missouri Supreme Court will consider an appeal Thursday involving a man in prison for the murder of a St. Louis woman that occurred seven years ago today. Ledale Nathan is challenging the length of his sentences. He was convicted of killing Rose Whitrock’s daughter, 34-year-old Gina Stallis, and seriously injuring two others during a home invasion in 2009. “I hope that the court will consider how heinous the incident was. Ledale is not the victim him here and while he was a juvenile, they don’t know the emotional part of it. He and Mario Coleman had every opportunity to leave our home. No one had to be shot. We begged them and begged them and begged them to give them anything,” says Whitrock. Whitrock, her mother, nephew and his girlfriend, Stallis and Stallis’ two young children were all in the home when Nathan and his accomplice, Mario Coleman forced their way in and terrorized the family for about 20 minutes. Whitrock says Nathan held a gun to the head of her 78-year-old mother and threatened to kill them. Whitrock’s nephew, Nick Koenig, was shot three times and Nick’s girlfriend, Isabella Lovadina, was shot five times. Stallis was killed by one bullet that entered her cheek and passed through her torso. Lovadina was a St. Louis police officer and Koenig was a firefighter at the time. Lovadina was not able to return to the police force after the incident. “I’m hoping that whatever decision that they make, that I don’t have to sit through another trial. The last time it had to be heard again with a jury and I don’t know if my family could do that again,” says Whitrock. Nathan was sixteen years old at the time of the incident. A jury found Nathan guilty of second-degree murder. A new state law took effect August 28 that makes Missouri compliant with federal sentencing laws for juveniles guilty of first-degree murder. The U.S. Supreme Court ruled in 2012 that Missouri must offer another sentencing option for juveniles guilty of first-degree murder, not just life without parole. The Missouri Legislature passed a measure during this year’s regular session that allows a life without parole or a minimum 25-year sentence for those under 18. Nathan is in the Southeast Correctional Center in Charleston, Missouri. 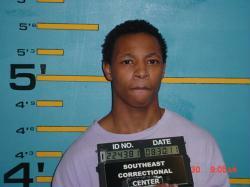 Coleman is serving prison time in the Potosi Correctional Center in Mineral Point, Missouri.